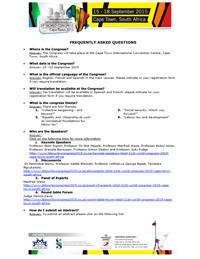 Please see below for updated documents on the Cape Town XXI World Congress. Posted in Cape Town 2015, ISLSSL Events, Meetings & Events on February 25, 2015 . 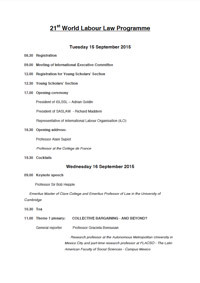 The XXI World Congress of the International Society for Labour and Social Security Law is taking place in Cape Town from 15 to 18 September 2015, hosted by the South African Society for Labour Law (SASLAW). The Local Organising committee are pleased to advise that a number of sponsors have been secured for the event, registrations are being processed and a good number of interesting paper submissions have been received to date. The submission deadline date is 15 April 2015. A round-table forum on Friday, 18 September will be of particular interest to the delegates, as Judge Dennis Davis, Judge of the Labour Appeal Court and President of the Competition Appeal Court will chair a case study of South Africa’s Labour Relations Act (LRA) 20 years into democracy, with a particular focus on whether ILO principles have contributed to workable labour relations. Forum members will include ILO experts who assisted in drafting South Africa’s 1995 LRA together with leading representatives of South Africa’s social partners. The Safari Company, the official housing and tour agency of the Congress, would like to help you experience Cape Town’s rich culture and history. A number of tours are on offer to the city’s most interesting cultural and historical sites and scenic surroundings. The tour descriptions, schedules and conditions are indicated below. You can also go exploring aboard an open-top double-decker bus. With two routes to choose from and buses every 15-25 minutes, this hop-on hop-off tour is a relaxed way to see the sights and scenery of the city and the Peninsula. A two-day pass includes a wine tour, a night-time bus ride to see the sunset over the Atlantic Ocean plus a trip with the hop-on hop-off water taxi along the canal between the CTICC and the V&A Waterfront . If there are any requirements for private touring, transportation or hospitality services, or interest in other parts of South Africa or Africa, please contact the official appointed agent, The Safari Company, who will be pleased to assist with any arrangements. * To note: All registration fees are payable in ZAR and are inclusive of VAT. Posted in Cape Town 2015, ISLSSL Events, Meetings & Events on February 11, 2015 . 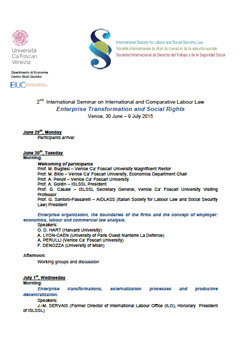 On February 1st 2015 we will open the registration to participate to the second edition of the Seminar on International and Comparative Labour Law to be held at Ca’ Foscari University of Venice (Italy), under the direction of Professor Adalberto Perulli. The seminar is addressed to legal scholars, graduate students and experts specialized in international labour law and labour law. The knowledge of the English language is essential to participate. Since the maximum number of seats is 30, we will give priority to the applications of enrolment which arrive first. The total cost of the seminar is 1000 Euro + IVA (Vat) (22%) = 1220 Euro, which includes accommodation (in June 29, out July 9, 2015, in an University Residence, in a single room with private bathroom), breakfast, meals and organization. 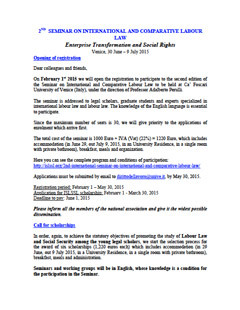 Applications must be submitted by email to dirittodellavoro@unive.it, by May 30, 2015. Please inform all the members of the national association and give it the widest possible dissemination. In order, again, to achieve the statutory objectives of promoting the study of Labour Law and Social Security among the young legal scholars, we start the selection process for the award of six scholarships (1,220 euros each) which includes accommodation (in 29 June, out 9 July 2015, in a University Residence, in a single room with private bathroom), breakfast, meals and administration. Seminars and working groups will be in English, whose knowledge is a condition for the participation in the Seminar. During the seminar, participants will be assisted by four tutors: Vania Brino (PHD, Professor of international labour law), Marco Biasi (PHD in labour law), Valentina Cagnin (PHD in labour law) and Giuseppe Paone (PHD in labour law). Only candidates coming from different countries from Italy are eligible. Maximum age of forty (40) years: preference will be given to those with less than 35 years. National associations must notify ISLSSL before the 15th of April 2015 the name, CV and other information provided by the candidate which has been selected. In the event the number of candidates nominated by national associations is greater than the total number of scholarships available (6), ISLSSL through the International Scientific Committee of the Seminar, shall select the six candidates. This Committee will have a maximum of 20 days to identify the 6 candidates that will receive the scholarships. The decision is final and cannot be appealed. Posted in ISLSSL Events, Meetings & Events, Venice Seminar 2015 on January 6, 2015 . Seminar conclusion by 1:00 p.m. Note: Lectures and working groups will be in English. Deadline to pay: 1 June 2015. Registration fees, which include accommodation in a University Residence, in a single room with private bathroom, (in 29 June, out 9 July), breakfast, meals and administration is 1000 Euros (+ IVA 22%, 1220 Euros). Direction and Coordination: Prof. A. Perulli. Further detailed information and registration forms are available at http://islssl.org/2nd-international-seminar-on-international-and-comparative-labour-law-registration/, or please write an email to dirittodellavoro@unive.it. Please note that the ISLSSL offers six scholarships of 1220 Euros each, with a view to covering registration fees and participation in the seminar, aimed at facilitating the participation of lawyers of less than 40 years. Application for ISLSSL scholarship: February 1 – March 30, 2015. Posted in ISLSSL Events, Meetings & Events, Venice Seminar 2015 on December 23, 2014 . 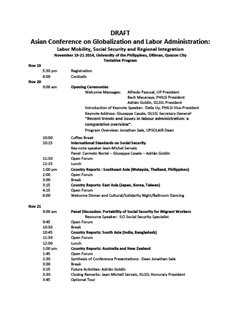 The Asian Conference on Globalization and Labor Administration: Cross-Border Labor Mobility, Social Security and Regional Integration is collaboratively convened by the Philippine Chapter of the International Society for Labour and Social Security Law, the University of the Philippines School of Labor and Industrial Relations, and the International Labor Organization’s ASEAN Triangle Project. The Conference intends to highlight the best practices in labor policies and laws in dealing with the challenges and risks brought about by increasing globalization and deepening regional integration. This theme is of critical importance to Asia particularly in the light of strengthened economic partnerships within the ASEAN+6 composed of the 10-member countries of the ASEAN region plus China, Japan, South Korea, India, Australia and New Zealand. The establishment of the ASEAN Community 2015 indicates a deepening ASEAN regional integration characterized by free flow of goods, capital, services and skilled labor. ASEAN has free trade agreements with China, Japan, Korea, India, Australia and New Zealand and negotiations are underway towards establishing the ASEAN+6 as a free trade area. Posted in ISLSSL Events, Meetings & Events on December 23, 2014 .
will bring new insights to the Congress themes. Click here to register for the EARLY BIRD RATE!! Papers will be presented in breakaway sessions and we urge researchers and practitioners, old(er) and young, to submit abstracts. This will be an event where the highest level of international scholarship and practical experience will be combined. Click here to submit an abstract. Sponsorship and Exhibition Opportunities available!! Posted in Cape Town 2015, ISLSSL Events, Meetings & Events on November 13, 2014 .